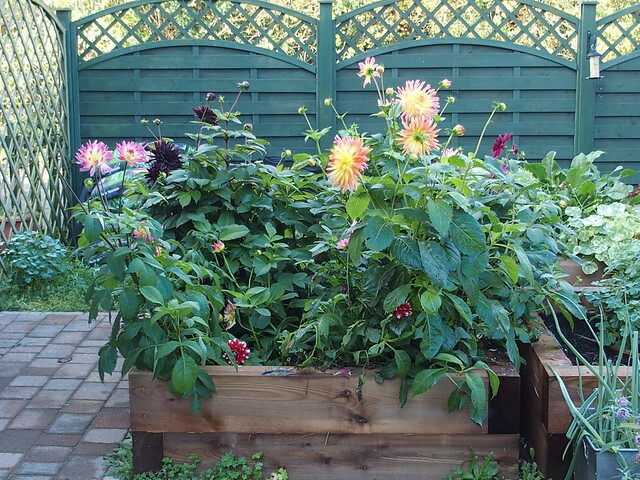 As I said when I dug them up, the dahlias have been the stars of the garden this year. Well-fed in one of my new raised beds, their flowered their stems off, even after Hurricane Barney knocked them onto their knees. They were unruly and unstoppable, and we’d happily grow them again just on that basis. But they were grown to eat, so we thought we’d give that a go. 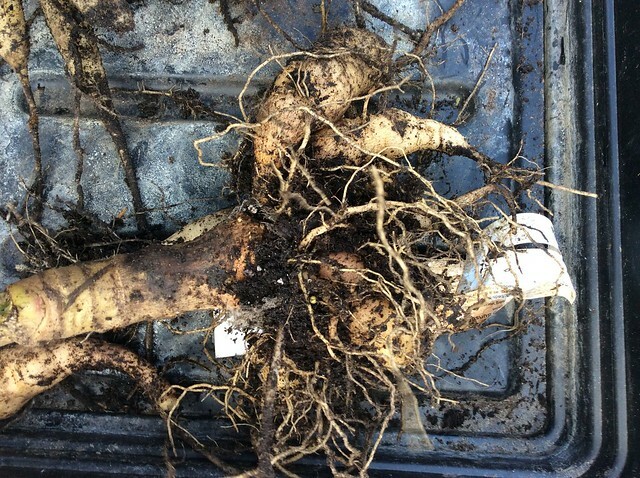 This was the root crown of Lubera’s DeliDahlia Hapet Sunset variety (henceforth known as ‘Sunset’) when I dug it up. 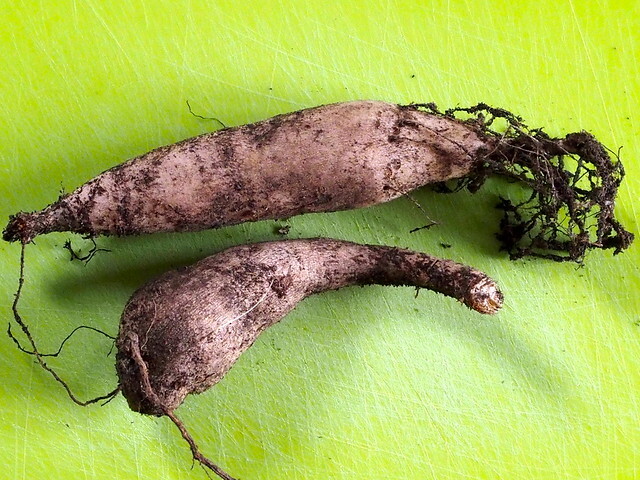 Most of it is now snugly sitting in a tray of compost, but there were two loose tubers, so we ate those first. They weighed 108g. A quick nibble of them raw gives a fibrous, crunchy, vegetable flavour – it’s not very strong, but it’s more root vegetable than potato. I thought I would combine them with other things, so that – in the event they weren’t very nice – we would still have some dinner! 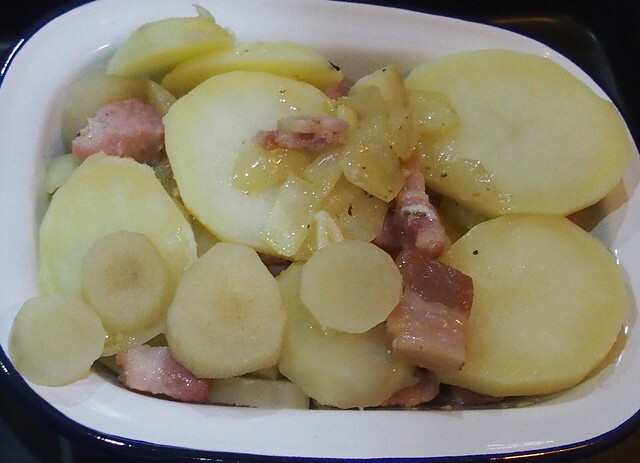 And so I decided to make a simple and rustic dish from the north of England, Pan Haggerty, with a slight dahlia deviance from the recipe. 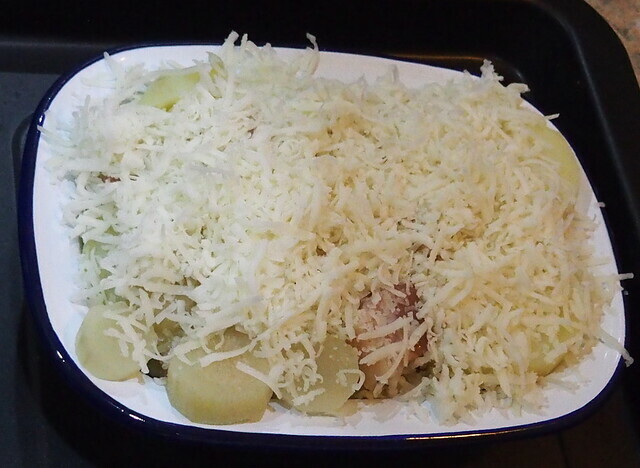 Pan Haggerty is one of those things that is made in different ways by different people, but the basic idea involves potatoes, onions, bacon and cheese. Lubera acknowledge that ‘Sunset’ is the most fibrous of their edible varieties, and needs a little more cooking than the others. So I peeled and sliced my tubers, and combined them with 370g of sliced potatoes. We boiled them for 10 mins or so, until the potatoes were tender. Tested at this point the tubers still had some crunch, and still tasted like an unidentifiable root vegetable – perhaps with a hint of something like celery. 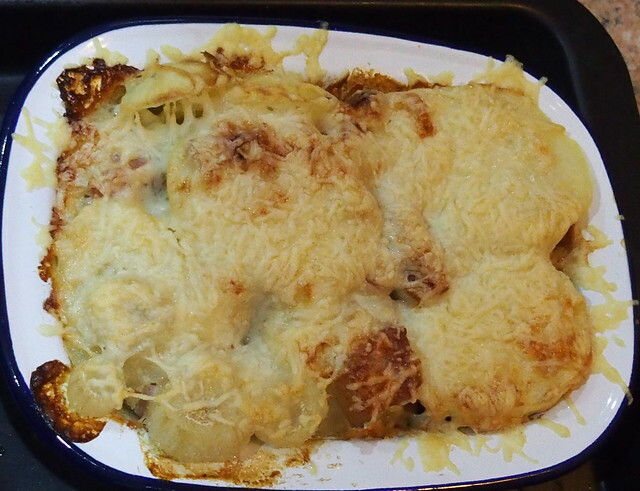 If, at this point, you used a soft-rinded brie-like cheese rather than a grated hard cheese, you’d have something more like tartiflette, and could pretend your meal is an alpine après-ski indulgence! Half an hour in a moderate oven (180 C for our fan oven) and you’ve got nice bubbly and browning cheese and a tasty dinner on your hands. We both happily tucked in and cleaned our plates. The final verdict on the ‘Sunset’ tubers was that they retained their crunch and their slightly enigmatic root vegetable flavour. They’re OK, but cooked this way they were nothing special. We thought perhaps their crunchiness would shine in a stir-fry (although they would still need parboiling, I imagine) or they could add a savoury root note to soups and casseroles. 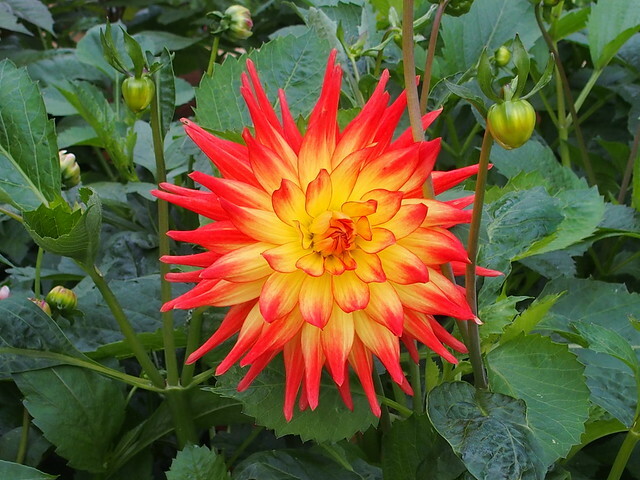 ‘Sunset’ is one of three varieties that Lubera recommend for container growing, so it’s ideal for people with small/ patio gardens – all that flower power and a vegetable crop at the end? You can’t really ask for more than that! I’m planning on short-listing our favourite varieties to grow again next year. Whether ‘Sunset’ makes the cut remains to be seen. Stayed tuned for more exciting episodes of Dicing with Dahlias! I’ve not heard of Pan Haggerty before, so will note that down just in it’s own right. It sounds similar to Farmer’s Breakfast, only with cheese instead of egg. Sounds like I should wait to hear how the other edible dahlia tubers taste, since I am not fond of anything with a taste of celery to it. As you say, it sounds like a great plant to grow just for the flowers. I look forward to your further adventures in Dicing with Dahlias.